For two quarters of Friday's second-round Class 6A girls basketball playoff game at Benson, tradition was beating talent. A South Medford team that started three freshmen and a sophomore was 11 points ahead of a Benson team of juniors who have been pegged for the state tournament since they were freshmen themselves. Shooting for an eighth consecutive trip to the quarterfinals, the Panthers hit six 3-pointers in the first half and had the quick Techsters looking sluggish. As well as the Panthers were playing though, it felt like the stakes were weighing on the Techsters. Benson, you see, last was in the final eight of a girls basketball state tournament in 1996. A year ago, the Techsters' dream ended in the first round to a lower seed. But with their dream of playing at Chiles Center on the line, the Techsters found their footing. They turned an 11-point halftime deficit into a 63-42 win that advanced them to an 8:15 p.m. Wednesday quarterfinal against second-ranked Tigard. "It's just great to see our kids have the collective will and the courage to take it — to believe they could do it and go out there and get it," Benson coach Eric Knox said. 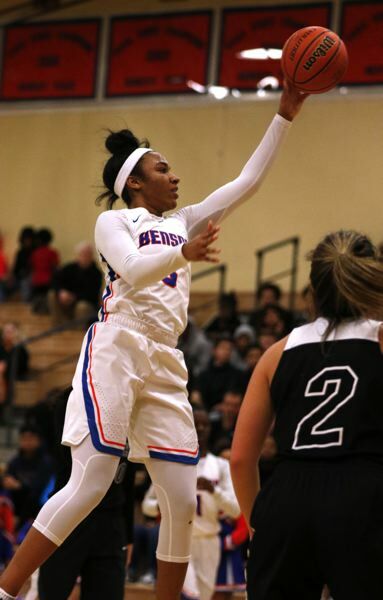 "We've had this vision since I was in eighth grade," junior guard Ciera Ellington said after scoring 13 of her game-high 20 points in the second half against South Medford. "We've been talking about this for years, and to finally get there is a big moment for us." While the Panthers were pouring in six first-half treys, Benson made one and missed a bunch. It was defense, however, that turned the tide — and not the easy press-induced runs the Techsters thrive on against less-athletic Portland Interscholastic League opponents. This was the kind of focused defense that took away South Medford's 3-point threat. "The halftime message from the coaches was we have to get after it. We're playing scared and acting like we don't want to be here," said 6-1 junior wing Tayler Lyday, whose activity was infectious on her way to 17 points. "We had to pick it up on defense." The momentum shift was immediate in the third quarter. A 9-0 Benson run in the first 140 seconds closed the gap to two points. A 3 from junior guard Makenzy Porter (scoreless to that point on Friday after making eight 3's in a first-round win over West Albany) put the Techsters ahead six minutes after halftime. By the end of a 23-4 third quarter, Benson had an eight-point lead and had cleared a big hurdle. Ellington — who in two playoff games last week totaled 52 points, 15 rebounds, 11 assists, six steaks and three blocked shots — said the third quarter was the best Benson has played in her three seasons. Knox said the second-half defense was the best his team has played. "We needed this in the worst way," Knox said. "We talked all year about breaking through, but it's very hard to break through. "We needed this not just for our team. We needed it for our school. Benson sports have struggled for a while, so when you have something special going, you want to push it as far as you can."